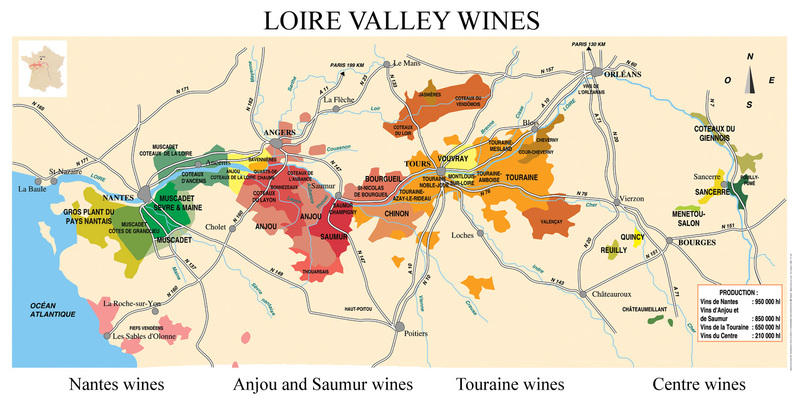 Welcome to the western-most region of the Loire, the Muscadet, where the only variety listed in the appellation area is the Melon de Bourgogne, a variety originating from Burgundy but now found mostly in the Muscadet. The white wine has been considered for years as a minor light wine fit to go with sea food, but a few vignerons have made a difference in a region plagued by mass production, first by keeping working on their soils, then by selecting particular terroirs of the Muscadet. Marc Ollivier of La Pépière is one of them. After the difficult vintage of 2012 with yields much lower than usual because of the bad season that year, the growers are looking forward for what 2013 has in store for them. Until now all we can say is that the vegetation growth is late in much of France because of a relatively cold spring with covered skies. The vineyard needs also higher temeratures and more sunshine to grow leaves, and because there has been more rain than needed, it has on the other hand encouraged the weeds and also delayed the plowing to get rid of these weeds, because the ground was too soft and muddy to allow the use of tractors. Any long-enough lull between the rainy days is thus exploited to do these important tasks of cutting the weeds' roots, and I witnessed this routine spring operation at Marc Ollivier's La Pépière in the Muscadet. Weedkillers-soaked vineyard We're speaking here of wines made from living vineyards, not from war zones like much of conventional vineyards farmed with all sort of harmful chemical products, and when you drive through Muscadet's side roads and vineyards in this season, you see mostly alas the latter. Unsuspecting wine tourists with little knowledge about how wine is made will not necessarily pay attention to the vineyard appearance at this time of early spring, and in summer when most visitors tour the region, the ground will be largely hidden by the flamboyant foliage. That's why visiting a wine region in different seasons opens new perspectives and enable fresh insight into the different aspects of the wine trade. Before we dropped at la Pépière, we had time to look around and to be frank the impression was quite appalling. Here above is the vineyard that we could look upon from the bed & breakfast, a vineyard probably owned by the people who managed this place as the farm was also a family winery. Much of the vineyards of Muscadet belong to this category, which I'll call of the grilled-grass type. The ground is cement hard and never plowed, and after years of weedkillers spraying there is virtually no life in there. Another variant of dead soil (you choose) This is another variant of the dead-soil vineyards encountered in Muscadet, this one is of the "moon surface" type, it's cement hard also, but the weeds never even had a chance to grow as the spraying prevented them to. I saw many of these chemical-soaked parcels when we toured the side roads before visiting Marc Ollivier, but this particular one was located along one of his own plots. I would say from first-hand viewing of the vineyards of the region that 96 % or more of the Muscadet vineyards are sprayed with weedkillers. Picture on the right : a modern spraying tractor at work in the Muscadet. Note the obvious difference between the appearance of couple of inter-rows on the left and the ones in the center and right, the ones on the left being alive with weeds (and worms and other insects when you dig a bit) while the rest is worryingly flat and dead still. Growers with minsets still rooted in the 1970s' consider yet these vineyards with dead soils as "clean" (propres), and they are very proud of their job. I don't know what is the rate of uprootings in the region but we fell upon several occurences where you could see piles of dead vines ot tractors hauling them to an unknown destination (pic on right, shot right near la Pépière). These vines may not be that old by the way, a heavy chemical use diminishing their life span and sometimes growers just replace the vineyard because the yields are not high enough. few of Marc Ollivier's vineyards, this particular one is Chateau Thébaud If I'm right. as you can see there's been lots of grass and Marc's workers have already cut off the weeds in the middle of the rows with a vineyard tractor. The second half of the job, removing the grass under the vines was being made when we visited. the vegetation growth is late but seems fine at this stage, and the frost risk is now behind. The writer of the article ends his topic with a suggestion that the trade increases its volumes with yet a price light increase for the growers "without frightening the consumers", but I suggest that they just do the opposite : go see the vineyards behind these rock-bottom prices and maybe (after all I'm not in the trade...) work a little more in the vineyards : the wine is made in the vineyard and when the vineyard is alive the end of the story is that the buyers fight each other to grab the wines and not all the way around. Marc Ollivier chatting with the tractor driver I shot this picture on the terroir of Clisson, where Marc farms his reds (a little known gem of the Muscadet region, not labelled under the AOC of course) : some Cabernet Franc, some Côt and a little bit of Cabernet Sauvignon. When we stopped there the guy on the tractor was busy doing row after row, taking off the weeds under the rows. A couple of workers on foot were also tilling under the vines after the tractor to finetune the job. You can see on the picture the two blades which cut the ground under the grass, and also the two metal rods that play the role of sensors : when they hit a vine, the blade tilts abruptly on the side, coming back as quickly as soon as it passed the vine. Horsetail for tea preparation At one point near the winery I spotted a flat pile of plants that had been recently cut, obviously for some kind of preparation. Marc Ollivier told me this was horsetail, which he had harvested the previous days in the Indre département further east, while visting friends who live over there in the vallée de la Brenne, a large wooded area with hundreds of ponds and lakes. The plant is a unique, sort of anachronistic plant, of the type that covered the planet several millions years ago. Horsetail is know to have medicinal properties, and in the organic/biodynamic agriculture it is used through tea preparation and sprayed on the plants as an alternative to copper-based products. Horsetail is very rich in silica. One of the staff, a young guy working at the winery is in charge of the biodynamic sprayings. They use also dandelion (pissenlit) but one of the challenges is that for a surface of about 40 hectares they need lots of herbs each time. The herb-tea preparations are sprayed on all of their vineyards but the heart of the biodynamic preparations, the 500 and the 500P are only used only on half of the surface. The herb tea is usually mixed with the mildew treatment. Tasting a few wines We tasted a few wines with Marc from both vats and bottles. As you may know, the tradition in Muscadet is use underground cement vats for the long élevage of the wine sur lies (on their lees). I shot this picture when we drove to the other chai (Remi Branger's family chai) to taste from an underground vat. 2012 is an interesting vintage because in spite of weather problems the quality is quite good. __ La Pépière generic cuvée 2012. From a fiber vat with grapes growing on the Clisson-granite area. There has been a bottling made from this wine (last march) already and we're tasting the second part, not bottled yet. Quite rich. 2012 is a year with concentration, Marc says, the season problems with the flower left fewer clusters on the vines and there was more concentration with lots of sugar and also acidity, the average potential alcohol at the picking being around 12,7. This is an excellent vintage, he says, adding it's too bad there's so little of it. The wine is delicious indeed. Speaking of the yields which were particularly low in 2012, he says he made 23 hectoliters/hectare on average (instead of 45 on a normal vintage). On the cuvée domaine (generic), they could compensate the downfall by purchasing some grapes, but the Clos des Briords which had a usual volume of 30 000 bottles will make only 16 000 in 2012. __ La Pépière, cuvée domaine (generic cuvée), bottle from the first bottling (march 2012). That's nice. Speaking od 2012 compared to 2011 he says that 2011 was very difficult with lots of rot and sorting. The 2 vintages resulted in low volumes but the problem with 2011 was the rot, while in 2012 the surviving grapes were very nice. And the quality of the 2011 wines is well below the 2009, 2010 and 2012. No crus communaux for the 2011, no Clisson, no Chateau Thébaud, it went all to the generic cuvée (sold out now). They tried to vinify one vat of Clisson but it's not good enough to justify a separate bottling, The cuvée Domaine 2011 cost about 5,65 € retail. so it ends up in the generic cuvéé like the rest. They use pumps to blend the vats in a large cement vat hanging above, and after resting there, the wine is bottled by gravity (see the picture on the left with the 2 cement vats used for gravity bottling). __ La Pépière, Clos des Briords 2012. Bottled a month ago. Very floral and intensely mineral. Buyers will have their quota reduced because of the lower production in 2012. Marc jokes that at the winery they're the only ones who will keep drinking this wine without restriction... The 2011 costs something like 6,6 € retail (tax included). __ La Pépière, Gras Moutons 2011. From the gneiss soils. Because of the more austere mineral terroir they make a longer élevage for Gras Moutons and this was bottled in october and relased on the market in the beginning of 2012. On usual vintages the production is between 15 & 20 000 bottles. Speaking of SO2, they add some in winter, not during a racking because they don't rack the wines, but to prevent the malolactic fermentation to start. The reduce the temperature of the wine during one month, and after that when the wine reaches backs 10 ° C, they do the SO2 adding. __ La Pépière, Clisson 2010, bottled november 2012.Old vines, like 45 to 100 years, sometimes they use only the vines from 50 to 100 or 120 years. 13,4 ° in alcohol, like 2009, but more acidity than in 2009, Marc says. Nice velvety feel in the mouth, very nice. 2-year élevage. A longer élevage would not be good because it would make the wine too rich for a Muscadet. __ La Pépière, Chateau Thébaud 2009. 30 month élevage, bottled in june 2012. The élevage in the bottles afterwards is inpoprtant too, it allows the wine to recover from the earth filtration. The style of Chateau Thébaud is a wine with more freshness and vividness, Marc says. The wine is fresh in the mouth indeed. __ La Pépière, Chateau Thébaud 2010. Sample taken a couple months ago from a vat. It should be bottled in 2 or 3 months, they're waiting it to open a bit. For me that sounds strange it's already very good the way it tastes now. __ La Pépière, cuvée "3" 2009. A new cuvée, made once in 2005 and then in 2009. "3" because 3-year élevage on lees. They make this cuvée when both the vintage is good and when they have volumes large enough. This is a blend of two parcels of Chateau Thebaud and one parcel of Clisson, the whole with a longer élevage. It's isn't labelled cru communal because it's a blend of 2 crus communaux. in 2010 they're working on the cuvée but might tempt a 4-year élevage, they don't know yet. Very aromatic wine indeed. __ La Pépière, La Pépie, Côt 2012. We're tasting the reds of la Pépière, which are among my favorite reds of the Loire valley, if little now and paradoxal in that region. As Marc leaves for a few minutes, Gwenaelle does the pouring and explanation of the wines. She is a wine passionate who recently joined the winery after a career in another field and she will become an associate in the winery, so at the end there will be 3 associates at La Pépière, Marc Ollivier, Remi Branger (the present associate whom you can see along Marc on the winery website) and Gwanaelle. This allows Marc to gradually have more time for himself. The weather was nice in august with cold nights and there was a nice maturity for the whites but because of the water they had less maturity and structure compared to other vintages. __ La Pépière, La Pépie, Cabernet Franc 2012. Lighter color of course. I like this one. The reds of La Pépière are unfiltered and have about 10 mg SO2 total. There may be sediments in the bottle, Marc (who came back) warns. __ La Pépière, Cuvée "3" 2010, from an underground vat at Remi Branger's family farm. The white made through 3 years of élevage (maybe for for this vintage). The wine is far from being ready now, says Marc. __ La Pépière, Cuvée Granit 2012, from a cask (also at Remi Granger's chai). This is another iconic cuvée of La Pépière for me, if not a typical one for Muscadet. It is made from Merlot, Cabernet franc, Cabernet Sauvignon and Côt, the Franc making 50% of the whole. Beautiful nose and very enjoyable mouth, easy swallow. Costs something like 6,6 € retail. For the reds they didn't go through shrinking volumes like they did for the Melon de Bourgogne. The blossoming happened when the weather was relatively nice and id they indeed picked a bit less for the reds, it was compensated by young vines that were joining production. It will be bottled in a few weeks or a month. This wine, like the Clos des Briords is available usually for 2 months and after that it's sold out. I understand that... Riddling machines for La Pépière sparklings At some point we saw the computerized riddling machine used for the sparkling wines. It's not his it was lended to him by the guy who helps them make the sparkling. The machine takes a closed pallet with bottles in the lying position and will gradually turn the whole thing so as to end with the bottles standing upside down (sur pointes), all the lees being sedimented in the far end of the bottle neck, ready for the disgorging. the whole riddling cycle is 6 days with the machine. Marc says that he used to make traditional-methode sparkling (Champagne style) for some 10 years but it was not interesting much his export market (he exports most of his produvction). Now he makes natural sparkling (méthode ancestrale) because there a deep interest for these wines and also this winemaking fits better to their philosophy. They began making these 2 years ago. Most natural sparkling, 'pet'nats are made by small, artisan wineries. About your photo of the sprayer at work in the vineyard, there are more modern ones than this one, but certainly this type you show is very popular and very common in the vineyards of France. The vigneron here is not spraying weedkiller but is spraying against maybe disease or insect. These sprayers are very powerful and send out a great cloud of spray. Often they are not properly set/calibrated/used in a way to minimise spray drift. Now just think how this practice might affect the health of the vigneron, his workers and his family (who may live nearby) or the inhabitants of the nearest village. The vigneron in the photo has a cab on his tractor so (provided the air filters of the cab are installed and working properly and the windows of the cab are closed while he is spraying) he’s probably fairly well protected. But think of a birds-eye view of a village and its inhabitants surrounded by many hundreds of hectares of vines and think of all those vines being sprayed several times throughout the year, every year of their lives. And do you think that every vigneron always waits for a day with no wind or very light wind before spraying (to minimise spray drift)? He should do, but probably does not! And then how far does the spray drift? My point is, how does this practice of regular time-based spraying affect the health of everyone in the area? A lot of those chemicals are potentially harmful to human health. And I haven't even mentioned yet the effect on the wild-life. Makes you wonder …..
Beautiful, educational post! Thank you! Bertrand, please keep asking your "naive" questions from outside the wine trade. If only more people asked such questions about many more topics.